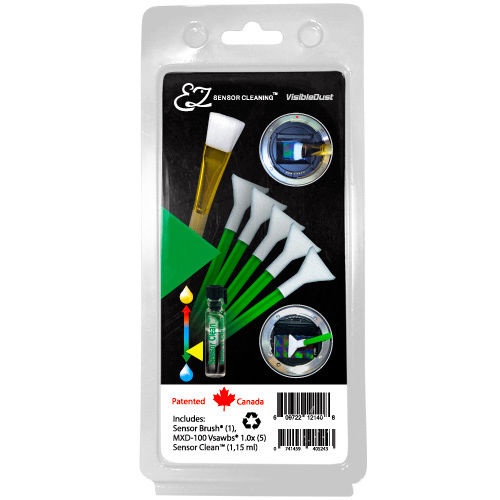 EZ sensor cleaning Sensor Clean has strong anti fog capability, strong anti static capability, streak free motion, is easy to apply, removes water stain fast, is non flammable, non alcoholic and best used with Ultra MXD-100 green swab. Green MXD-100 V swab patented V shape give best maneuverability inside chamber, V shape results in homogeneous motion. It's the best options for corners due to its V shape, compatible with all three solutions, multi fabric ensures best results for oil and smear removal, its soft texture is safe on coated sensor, best used for fluorine coated sensor, streak free motion.